Cecilia is a Project Support Officer at IMAS Taroona and the Centre for Marine Socioecology. In this role, she provides support in a variety of projects performing a wide range of tasks such as mapping, spatial and statistical analysis, website maintenance and admin. Cecilia carried out her first degree in Biological Sciences at the University of Patagonia in Argentina. Her thesis was related to assessing sampling methods to estimate penguin abundance. 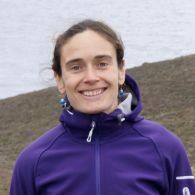 Later on Cecilia completed her PhD at the University of Comahue (Argentina) studying the impact of tourism on penguins. After finishing her PhD, Cecilia decided to redirect her career towards GIS and spatial analysis and moved to Tasmania to pursue a Master degree in Remote Sensing and GIS. Before joining IMAS, Cecilia was collaborating in several projects at CSIRO and the Tasmanian Land Conservancy, and also worked as a Grant officer in the Office of Research services at UTAS. Cecilia was a teaching assistant for one year in Botany and two years in Population ecology at the University of Patagonia. Cecilia also has taught several workshops on seabirds to tour guides, school teachers, and undergrads. Cecilia’s work supports a variety of projects such as Redmap, marine hotspots, species redistribution, Australian coastal communities’ vulnerability to climate change, and Blue economy. This is funding awarded as a prize, The Thinkable Peer Prize for Women 2017, and given to UTAS as a donation. It will be spent on research related to the prize nomination topic interdisciplinary investigations of climate-driven species redistribution. The project builds on previous climate impact and adaptation programs invested in by FRDC Southeast Australia Program (SEAP) and the FRDC-NCCARF Marine National Adaptation Research Plan (1). The information generated by that suite of projects, in particular the physical (2) and biological projections (3) is now outdated due to the rapidly advancing nature of the field, and no longer represents the latest available information. The focus of this work was at relatively long time scales (e.g. 2060 to 2100), although shorter projections were attempted. Since this work, climate models have also improved and can now provide finer scale spatial and temporal scenarios which are more real for fisheries managers and stakeholders.